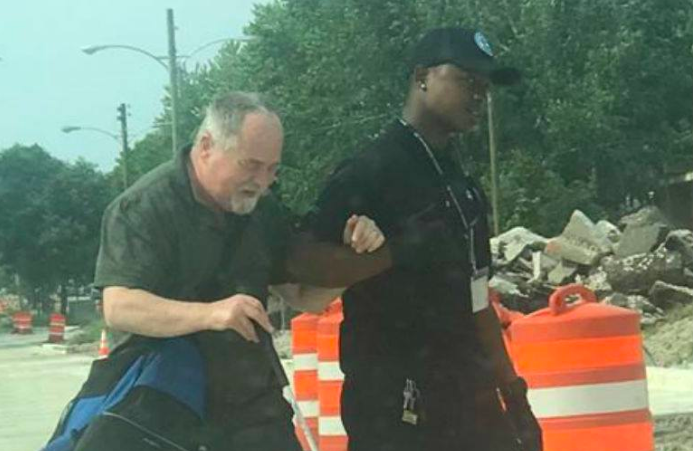 Thaddaus Turner, a 28-year-old public bus driver, became an unlikely hero after quite literally going the extra mile to help a blind man get home. Incredible footage shows the Milwaukee County Transit System employee springing into action when he realized that his regular customer would struggle to navigate his way across the street following an unexpected change in the bus route. “The route was barricaded, it was rough for me as a driver, I can only imagine how rough it was for him,” Turner told CNN. Gene Hubbard had been traveling the exact same route nearly every single day for the past 20 years when the bus company was suddenly forced to go around a section of road that was under construction. When Turner was snapped helping the handicapped man get back on course for his journey, the photo quickly went viral. Bystander Sydney Kazmierczak captured the image as Turner led Gene off the bus, across the road and around the construction works. Another MCTS bus driver to the rescue!Sydney Kazmierczak captured this photo Thursday near 60th and Cold Spring, and said the MCTS bus driver helped a passenger who is blind cross a busy street. ?? As for Turner himself, he was rather overwhelmed by the sudden attention of the national news media. This is not the first time the Milwaukee County Transit System has been in the news. In February, footage captured a female bus driver comforting a young girl after her mother had an unexpected seizure. In the past, MCTS employees have acted heroically to help a lost 10-year-old boy who was eight kilometers from home, a pregnant woman going into labor and a passenger having a heart attack.